Add all ingredients to food processor and process to desired consistency. Set sauce aside. In a large bowl toss wings with Chipotle Olive Oil, Chipotle Barbecue Rub and salt. Allow to sit for about 15-20 minutes. Place on sheet pan and bake in oven for 20 minutes. After 20 minutes, brush both sides of wings with Mango White Riserva Balsamic Vinegar. Return to oven for another 10 minutes (turning once), and then broil 5 minutes longer to caramelize. 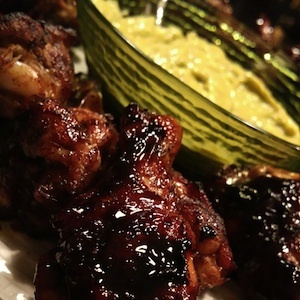 Serve wings with dipping sauce and enjoy!